The division was created for the first Legislative Assembly election in 1974. Formerly known as MacDonnell, the division was renamed Namatjira at the 2011 redistribution without changes to the existing boundaries. The new division name applies at the 2012 general election. Albert Namatjira is regarded as one of Australia's greatest artists and as a pioneer of Aboriginal rights. The 2015 redistribution saw Namatijira gain areas south of Heavitree Gap from the division of Araluen and areas east of Alice Springs from the abolished division of Greatorex. Areyonga, Haasts Bluff, Hermannsburg, Kintore, Mount Liebig, Papunya, Wallace Rockhole and surrounding communities moved to the division of Stuart. This division is bounded by the Queensland, South Australia and West Australia borders and extends across the Northern Territory to the north of Alice Springs. 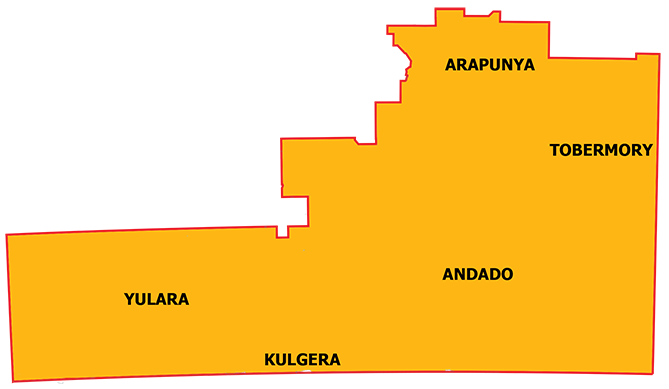 The division includes the communities of Amoonguna, Ampilatwatja, Aputula, Arlparra, Atitjere (Harts Range), Kaltukatjara, Santa Teresa and Yulara.